Massive seagrass beds in Western Australia’s Shark Bay have showed little recovery from a devastating 2011 heat wave, according to a new study. The team’s findings demonstrate how certain vital ecosystems may change drastically in a warming climate. Several years after a harsh 2011 heat wave, a once-lush seagrass bed still struggles to recover. Shark Bay, a UNESCO World Heritage site, features 1,853 square miles of seagrass beds, which UNESCO’s website calls the “richest in the world.” This vast, subtropical ecosystem hosts thousands of large sharks, other fish, sea turtles, bottlenose dolphins and a critical population of dugongs, plant-eating mammals related to manatees. The researchers surveyed 63 sites in Shark Bay four times between 2012 and 2014 to assess seagrass recovery and changes. Before the heat wave, many sites were dominated by the temperate seagrass, known as “wireweed,” whose dense and tall thickets provide ample food and shelter for numerous species. The heat wave drastically thinned many wireweed beds, and in many places their underground stems blackened and died, leaving bare sand. The new study showed that surviving wireweed beds appeared stable but didn’t reclaim much turf. Instead, a tropical seagrass that is a close relative of a seagrass native to Florida, began filling the gaps. “The seagrass hit hard was the most common species — and was dense like a mini forest,” said Mike Heithaus, dean of FIU’s College of Arts, Sciences & Education. Heithaus was the doctoral advisor to Nowicki and co-author of the study. “Losing that cover is really huge; it’s like going from a bushland in Africa to a well-mowed lawn. Losing that much structure has consequences, including loss of water clarity. Fewer seagrasses were available to trap sediments, and decaying seagrass may have nourished a bloom of microscopic algae observed in 2014. Study authors say these consequences aren’t surprising, given the valuable ecosystem services healthy seagrass beds provide. Seagrass beds stabilize sediments, preventing erosion and clarifying water. More seagrass biomass can store more carbon dioxide, decreasing its availability to harm ecosystems through climate change and ocean acidification. Dense seagrass beds are also critical for economically important fisheries. Seagrass meadows are valued at $1.9 trillion worldwide just for their role in cycling nutrients, according to a 2009 study by others in Proceedings of the National Academy of Sciences. However, major seagrass ecosystems around the world have declined by about 7 percent per year since 1990, reminiscent of declines in coral reefs and other critical ecosystems. Some take-home messages are clear — It’s critical to monitor ecosystems well after a disturbance because they are not guaranteed to bounce back. 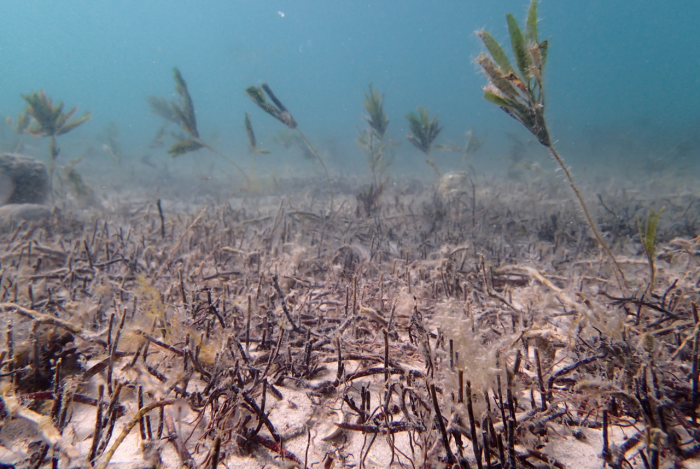 Also, if relatively pristine seagrass beds of Shark Bay are vulnerable to extreme weather, then it’s unclear how seagrass beds damaged by human activity will fare in the coming decades. Nowicki says that minimizing local stressors, such as nutrient pollution from fertilizer runoff into bays and estuaries, may give seagrasses better odds amid climate change and other global stressors. “If Shark Bay had poorer water quality, we might have lost a lot more,” Nowicki said. The latest study, published recently in Marine Ecology Progress Series, included partners from FIU, Deakin University in Australia and Nova Southeastern University in Fort Lauderdale.